Before any discussion of the so-called “Shreveport” submarines, it should be mentioned that a Civil War era submarine has been located and is currently being restored in Louisiana. Actually its location has never been a mystery. It has been seen, photographed and gazed upon by the residents of New Orleans for over 100 years. It is now in the possession of the Louisiana State Museum and is being prepared for display. Hopefully this will be accomplished before the Civil War Sesquicentennial. The big mystery of this submarine is who built it. It had been speculated that it was the Hunley group’s first attempt at a submarine, the Pioneer. Documents and drawings recently uncovered by author Mark Ragan in the National Archives seem to disprove the museum’s submarine as being the Pioneer. The following correspondence in the Official Records appears to be the main argument for the existence of submarines in Shreveport during the Civil War. The letter was written in March of 1865 and is based on a letter from a ‘confederate scout’ to someone not named living in New Orleans. This is third and fourth party information. Basically it is a rumor. To use the courtroom analogy once again, if you were trying to prove the existence of Submarines in Shreveport and all you had was hearsay evidence, then you would lose the case. Hearsay statements are not accepted as evidence in court. New Orleans, La., March 13, 1865. Mr. Hunnicutt’s report of the designs of Jones (also from Lavaca), who was at Houston, Tex., January 12, to destroy the iron-clad Tennessee and other gun-boats at the mouth of Red River, leads me to believe that there is some such plan on foot, of which the commanders of gun-boats should be notified. The boat is forty feet long, forty-eight inches deep, and forty inches wide, built entirely of iron, and shaped similar to a steam-boiler. The ends are sharp pointed. On the sides are two iron flanges (called fins) for the purpose of raising or lowering the boat in the water. The boat is propelled at the rate of four miles an hour, by means of a crank worked by two men. The wheel is on the propeller principle. The boat is usually worked seven feet under water, and has four dead-lights for the purpose of steering or taking observations. Each boat carries two torpedoes, one at the bow attached to a pole twenty feet long; one on the stern fastened on a plank ten or twelve feet long. The explosion of the missile on the bow is caused by coming in contact with the object intended to be destroyed. The one at the stern on the plank is intended to explode when the plank strikes the vessel. The air arrangements are so constructed as to retain sufficient air for four men at work and four idle, two or three hours. The torpedoes are made of sheet-iron three-sixteenths of an inch thick, and contain forty pounds of powder. The shape is something after the pattern of a wooden churn and about twenty-eight inches long. Jones, the originator and constructor of these boats, also constructed the one which attempted to destroy the New Ironsides in Charleston, S. C.
Major, Tenth U. S. Colored Heavy Artillery. The description of the submarines is contradictory and contains elements of both the Pioneer and the Hunley. The Pioneer was the first submarine built by H.L. Hunley, James McClintok and Baxter Watson. It was constructed in New Orleans during the fall of 1861. The Pioneer made several successful dives in Lake Pontchartrain but apparently never saw combat. It apparently did however make several successful practice attacks on barges in Lake Pontchartrain with the towed weapon. When the Federal fleet captured New Orleans in April of 1862, the Pioneer was scuttled in the New Basin Canal and was latter discovered by the Federals. 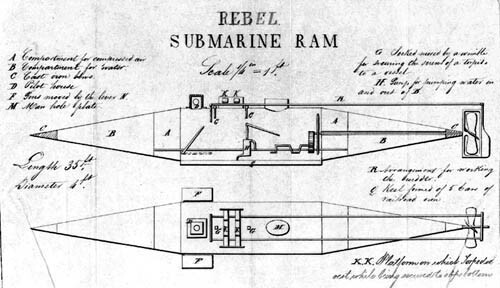 A Union engineer drew a diagram of the submarine. Note the ‘sharp pointed’ ends, and single conning tower or pilot house with deadlights. Presumably there were four deadlights, one on each side or one on each side, one in front and one on top. The diagram shows a length of 35 ft. and diameter of 4 ft. (48 inches). It is 5 ft. shorter than the description in Major Jackson’s letter but the two person hand crank fits the line: “a crank worked by two men”. The air arrangements for four men working and four idle more closely fit the Hunley as does the description of a spar torpedo. It is interesting to note that the information is coming from someone living in New Orleans who may have seen the Pioneer after it was pulled out of the basin. It rested there on the bank until the end of the war and was then sold for scrap. Based on Major Jackson’s description, this is what the Trans-Mississippi submarines may have looked like if completed. This type of craft would have been far easier to build in Shreveport than a “Hunley”. The Hunley was a purpose built from the ground up submarine. As more of the Hunley is investigated, it is becoming apparent that it was a complicated and sophisticated machine. Building something of that technical nature was not possible in Trans-Mississippi Shreveport. Railroad locomotive boilers could have been used but finding four locomotives to confiscate or purchase would have been difficult if not impossible in Shreveport during 1864 or 65. There was no way for a train locomotive to get to Shreveport since all railroads were torn up and the iron confiscated to build the Missouri. There is some record of iron being stripped off of a steamer in Lake Charles and being turned over to R. W. Dunn “for torpedo service”. It took Hunley, McClintock and Baxter three years to build three different submarines. How could four submarines be built in a few months in a place with little or no industrial capacity? There were no rolling mills for shaping iron plates anywhere in the vicinity of Shreveport during the Civil War. Lt. Carter mentions this in his letter book. More proof of the inability to shape heavy iron is the fact that the Missouri was armored with iron rails and not plates. Apparently it was difficult to even cut iron in Shreveport since the rails were laid onto the casemate of the Missouri at an angle. This was evidently done to prevent cutting as mentioned in the previous description of the Missouri. The only cutting that would have been required was over the gunports and near the bottom sides of the casemate where the decreasing angle called for shorter pieces of iron. Lt. Carter was tasked with building two ironclads but could only come up with enough raw materials to build one. By the time the Missouri was completed, there was nothing left in the area with which to build another ironclad. How then could four submarines be constructed? It is possible if any were built, much like the never built sister of the Missouri, the planned number of vessels was never completed. Maybe three or two or one or what is most likely, none. In Mark Ragan’s book, “Submarine Warfare in the Civil War”, he details an account of James Jones and the Federal spy Hunnicut meeting on the stage from Marshall, Texas. In this meeting, according to Hunnicut, Jones offers him a chance to join a “Torpedo Association” involving the venture to send submarines to attack the ironclad Tennessee at the mouth of the Red on the Mississippi River. This apparently would only cost Hunnicut $5,000 if he wanted to participate. Was it possible that Jones knew Hunnicut was a spy and was feeding him false information in an attempt at counter-intelligence? Or is it possible that Jones was merely trying to get a quick $5,000 from a gullible stranger? Even if submarines were constructed in Shreveport during the Civil War it is highly unlikely that they would have been used in the Red River. The river current was at least 4 mph in most places and the depth of the channel too shallow for submarine operations. With 4 mph being the maximum speed of a manually cranked submarine, there would have been no way to move upstream. Propelling, diving and navigating downstream in the turbulent waters of the Red would have been nearly impossible even for short distances. It was difficult enough for normal surface boats to navigate the Red much less an underwater craft. Underwater visibility would have been zero. Any attempt at steering a two ton, iron submarine in the narrow, twisting, shallow, log infested river would have resulted in death for anyone brave or foolish enough to attempt it. There is the possibility that the submarines were not intended to operate in the Red River but to somehow be transported elsewhere. Jackson’s report and the stage incident mention Jones’ purpose for their construction was to attack the Tennessee at the mouth of the Red on the Mississippi River. Although the Mississippi is larger and easier to navigate than the Red, it still would have been a suicidal mission. The current of the Mississippi is much faster than the Red. The record of the Hunley and her earlier sisters suggest that calm, smooth, clear waters are the only operational conditions for a hand cranked submarine to have any hope of success and survival of the crew. Even that is no guarantee as the Hunley sank twice and lost two crews in training before sinking a third time with the loss of all on board. The problem of getting the subs in the area of a target would have been a huge obstacle. It took two flat cars to transport the Hunley from Mobile to Charleston. There is the possibility of the subs being towed on the river or somehow carried on a steamer but operational boats big enough for the task were few and far between by late 1864. Barges could have been used which seems the most likely mode of transportation.